Earlier: Early Friday morning, gunmen stormed the Radisson Blu hotel in Mali's capital city of Bamako, taking hostage 140 guests and 30 employees, according to the hotel group in a statement. The luxury hotel west of the city's center is a popular destination for foreigners, including ex-pats and traveling businessmen. The Bamako hotel attack began at around 8 a.m. and quickly captured international attention, particularly in light of last Friday's brutal terrorist assault in Paris that killed 130 people. 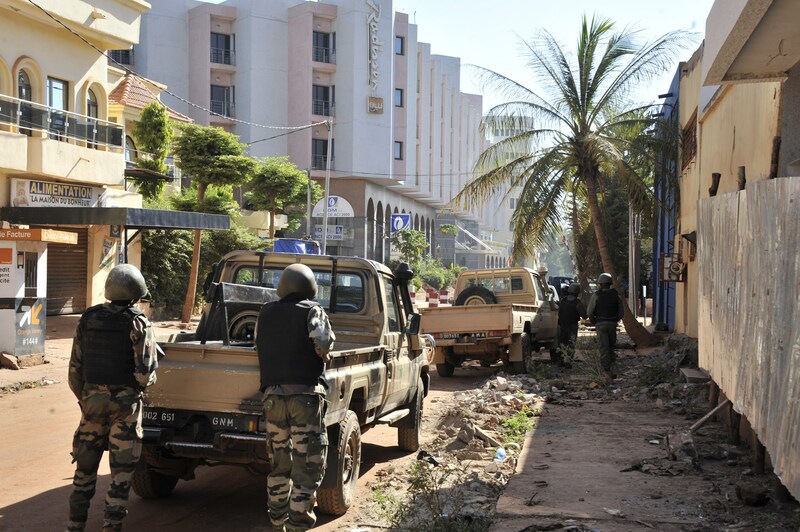 According to the Rezidor Hotel Group, which owns the Radisson chain, there were two gunmen, though Malian army commander Modibo Nama Traore claimed there were 10 attackers. Traore also said the gunmen arrived in vehicles with diplomatic plates and shouted "Allahu Akbar," an Islamic phrase that means "God is great," upon entering the hotel. After a couple hours, gunfire and explosions died down, and a standoff between the attackers and police began. No group has claimed responsibility for the attack so far. United Nations security forces are at the scene aiding Malian police. Two Malians and a French national died in the attack, according to CNN. State broadcaster says 80 hostages have been freed. A few hostages who were able to recite the Quran were released, according to Reuters. Guinean singer Sekouba Bambino was also among those freed. Some guests escaped or were escorted out by authorities. Five Turkish Airlines staffers were freed, but two more remained inside the hotel, according to Turkish state media. An unknown number of Air France crew members are also reportedly inside. At least seven Chinese people have been taken hostage as well, according to Chinese state media. Mali President Ibrahim Boubacar Keita is returning to the country from Chad to handle the ongoing situation, according to his office. The U.S. Embassy in Mali has warned American nationals to seek shelter and safety. The U.N. Mission in Mali said in a statement, "The special representative of the UN Secretary General and the UN force in Mali together denounce the terrorist attack taking place at a Bamako hotel."